They’re radishes, only slightly less boring. Oblong, with a pink base fading to a white tip, occasionally they have a pretty blush of pink inside when sliced in half lengthwise. Growing tip: companion-plant them with beets (a double, close-by row), in their own row 2-3 inches away from the beets. 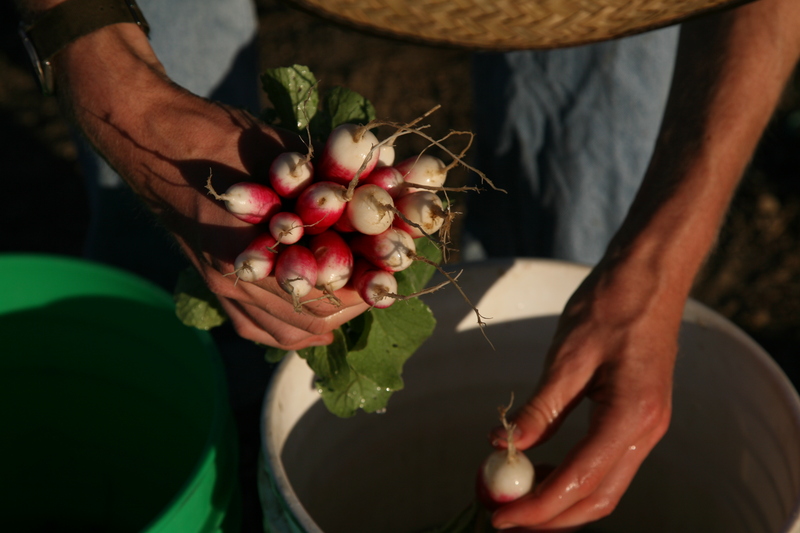 Since the radishes are harvested in just a few weeks–compared to beets which take longer to bulb–they don’t interfere with one another, and it saves you the work of preparing a separate bed for the radishes. Also (and I’m not sure if this really helps or not because I haven’t harvested a just-radish bed and a radish-by-the-beets bed at the same time and taste-tested), the beets afford the radishes a modicum of shade by the time they’re bulbing, which might keep them a touch cooler, which might make them a bit less spicy. Fancy-looking: impress your friends, customers, family, lovers with your refined French palate. More heat-tolerant than traditional varieties. Even in hot weather, it ain’t like eating wasabi. Lovely internal texture. Something about them is so smooth, it’s almost creamy, but crunchy at the same time. Bugs don’t seem to eat the roots. The roots very rarely split — far less frequently than the traditional round bulb varieties, which can split when they get too big/wet/hot (I’m not exactly sure what combination of conditions bring it on). Goes well with butter, or so we’ve been told by excited customers. Apparently this is how they’re usually eaten in France: you spread butter, take a bite, spread butter, take a bite… how do those French people stay so thin anyway? High in vitamin C (as all radishes are) as well as minerals like iron (especially important for the ladies — 11% of all women between 20 and 49 are iron deficient! ), sulfur (needed to produce collagen, which keeps your skin looking young), and iodine (necessary for a healthy thyroid). Can be added to vegetable juice–especially if you’ve got a cold–to provide a bit of kick, not to mention sinus-clearing, and throat-soothing abilities (thanks to antioxidant, anti-inflammatory properties). Quick to grow (like all radishes) — about three weeks should do it.